The rezoning application for Parkview Slopes proposes to add an Official Community Plan (OCP) amendment bylaw for Council’s consideration, with the understanding that the amendment can be processed concurrently with the rezoning consideration and not add significantly to taxpayer costs or the time frame for review. 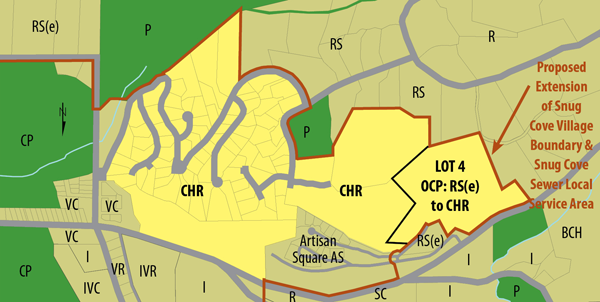 Currently the area of Parkview Slopes has two land use designations in the OCP. The east portion is designated CHR (Cates Hill Residential), and the west portion is designed RS(3) (Rural Residential). This application proposes to change the land use designation in the OCP for the west portion (i.e., Lot 4, District Lot 489, Plan LMP44190 except part subdivided by Plan BCP2107) from RS(e) (Rural Residential) to CHR (Cates Hill Residential) — and to extend the Snug Cove Village Boundary and the local service area of the Snug Cove Sewer System to include Lot 4. Policy 158 of the OCP states: “By way of a future amendment to this Plan, the Municipality will designate the Village Residential and Cates Hill Residential areas as a Development Permit Area for the purposes of form and character of multi-family residential development.” We have asked for input from Municipal staff about how to implement this Policy.